Celebrate Earth Festival tomorrow at Croft Farm! Join Sustainable Cherry Hill and Cherry Hill Township at 10 a.m. tomorrow for the fourth annual Art Blooms Earth Festival at Croft Farm. This free, daylong event celebrates Cherry Hill's commitment to educating and engaging the public on sustainability, health and wellness, and much more. The day begins at 8 a.m. with the second annual Family-Fun Bike Ride, and continues from 10 a.m. to 2 p.m. with free e-waste recycling, local entertainment, green vendors and crafters, delicious food, nature walks, and a very special appearance by the Phillie Phanatic! Everything takes place on the grounds of historic farm, located at 100 Borton's Mill Road. For more information, including a full list of events and sponsors, visit Sustainable Cherry Hill online, or click here. I hope to see you there! Earth Festival is the official kick-off event to Art Blooms, the Township's annual, two-week-long celebration of local arts and culture. The celebration begins at 6 p.m. tomorrow with a "Meet the Artists" Opening Reception, inside the Croft Farm Arts Center, 100 Borton's Mill Road. This year's celebration features a special Eco-Friendly Fashion Show at 7 p.m. Tuesday, April 30, and much more. All events are either free or low-cost to attend; for more information and a full list of events, click here, or contact the Recreation Department Monday-Friday at (856) 488-7868, or Events@chtownship.com. On Monday night, Township Council gave final approval to a measure that increases accountability on the part of owners of vacant homes in Cherry Hill and strengthens the Township’s ability to ensure those properties are kept secure and well-maintained. The ordinance, which requires owners of vacant homes to register them with the Township annually and designate a local point of contact who can receive and respond to property maintenance complaints, is one that will help protect and preserve the quality of life in our neighborhoods. Please read more about it by clicking here. 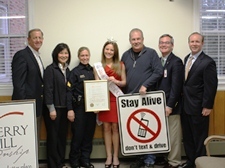 Cherry Hill Township and the Cherry Hill Police Department are partnering with Lindsey Giannini, Miss Atlantic County 2013, to educate local residents on the dangers of texting and driving. Lindsey spoke about her "Stay Alive: Don't Text & Drive" campaign at the April 22 Town Council meeting, where she was presented with a special proclamation declaring the Township's support of the program. As part of the program, Lindsey has agreed to donate four large awareness signs that will be installed later this spring at Cherry Hill High Schools East and West, Camden Catholic High School, and Camden County College. Texting and driving is one of the leading causes of traffic accidents and related injuries in the United States - and the consequences can be devastating. Council and I are proud to bring this important message to the residents of Cherry Hill. For more on Lindsey's campaign and the Township's participation, click here. The Township's Glee Show program will be the highlight of your child's summer! We welcome all children in grades 4 through 10 who love to sing to this special 5-week program that will help them develop musical skills, singing and audition techniques, stage presence and confidence as a performer. The program culminates in two special performances (July 31 and Aug. 1) at Cherry Hill East that will give every participant a chance to appear on stage! Tickets to the final show are $10 each; and as an added surprise this year, I will play a special guest role! The program runs from 9 a.m. to 1 p.m. Monday-Thursday from July 1 to Aug. 1 at Cherry Hill East. Registration is $295 per child; prices include music and a shirt. This is a wonderful chance for your child to perform with new friends who share their same passion! For more information or to register, call (856) 488-7868, e-mail Recreation@chtownship.com, or go to www.CherryHill-NJ.com. My office has received several calls this week about the National Prescription Drug Take Back Day, scheduled to take place at locations across the United States this weekend. Cherry Hill is not participating in that event this year. However, Cherry Hill does participate year-round in Project Medicine Drop, a partnership with the New Jersey Attorney General's Office. Residents can deposit unwanted medication at the Cherry Hill Police Department (820 Mercer St.) 24 hours a day, 7 days a week. For details and guidelines, click here. Camden County will host another free chair yoga class for seniors, from 1-2 p.m. next Wednesday, May 1, in the N. John Amato Council Chambers (Room 208) at Town Hall. Chair Yoga allows individuals to participate at their own level, while building flexibility and strength through the exercises taught by yoga expert and registered nurse Barbara Piotrowski. Two more sessions will be offered, on Wednesday, May 15, and Wednesday, May 29. For more information or to register, call (856) 488-7868, or email Recreation@chtownship.com. Looking for a fun way to celebrate Earth Month? Visit Recyclebank to travel back in time to some major milestones of the past, starting with the very first Earth Day in 1970. Inside Recyclebank's Eco Time Capsule, you'll be able to collect tips for living green today while exploring pop-culture trends and events from the last four decades. You could earn more than 500 points throughout the month! Each week through May 11, Recyclebank will bring you another decade of trivia and tips, so keep going back. It's just one of the many ways you can earn points for deals and discounts at Recyclebank.com. Join Sustainable Cherry Hill and Cherry Hill Township at 10 a.m. tomorrow for the fourth annual Art Blooms Earth Festival at Croft Farm. This free, daylong event celebrates Cherry Hill's commitment to educating and engaging the public on sustainability, health and wellness, and much more. The day begins at 8 a.m. with the second annual Family-Fun Bike Ride [http://www.cherryhill-nj.com/DocumentCenter/View/1453] , and continues from 10 a.m. to 2 p.m. with free e-waste recycling, local entertainment, green vendors and crafters, delicious food, nature walks, and a very special appearance by the Phillie Phanatic! Everything takes place on the grounds of historic farm, located at 100 Borton's Mill Road. 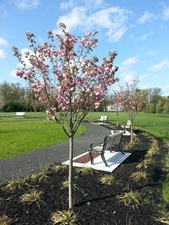 For more information, including a full list of events and sponsors, visit Sustainable Cherry Hill online [http://www.sustainablecherryhill.org/get-involved/earth-day-festival/] , or click here [http://www.cherryhill-nj.com/DocumentCenter/View/1452] . I hope to see you there! Earth Festival is the official kick-off event to Art Blooms, the Township's annual, two-week-long celebration of local arts and culture. The celebration begins at 6 p.m. tomorrow with a "Meet the Artists" Opening Reception, inside the Croft Farm Arts Center, 100 Borton's Mill Road. This year's celebration features a special Eco-Friendly Fashion Show at 7 p.m. Tuesday, April 30, and much more. All events are either free or low-cost to attend; for more information and a full list of events, click here [http://www.cherryhill-nj.com/DocumentCenter/View/1438] , or contact the Recreation Department Monday-Friday at (856) 488-7868, or Events@chtownship.com [mailto:Events@chtownship.com] . On Monday night, Township Council gave final approval to a measure that increases accountability on the part of owners of vacant homes in Cherry Hill and strengthens the Township’s ability to ensure those properties are kept secure and well-maintained. The ordinance, which requires owners of vacant homes to register them with the Township annually and designate a local point of contact who can receive and respond to property maintenance complaints, is one that will help protect and preserve the quality of life in our neighborhoods. Please read more about it by clicking here [http://www.cherryhill-nj.com/CivicAlerts.aspx?AID=234] . Cherry Hill Township and the Cherry Hill Police Department are partnering with Lindsey Giannini, Miss Atlantic County 2013, to educate local residents on the dangers of texting and driving. Lindsey spoke about her "Stay Alive: Don't Text & Drive" campaign at the April 22 Town Council meeting, where she was presented with a special proclamation declaring the Township's support of the program. As part of the program, Lindsey has agreed to donate four large awareness signs that will be installed later this spring at Cherry Hill High Schools East and West, Camden Catholic High School, and Camden County College. Texting and driving is one of the leading causes of traffic accidents and related injuries in the United States - and the consequences can be devastating. Council and I are proud to bring this important message to the residents of Cherry Hill. For more on Lindsey's campaign and the Township's participation, click here [http://www.cherryhill-nj.com/CivicAlerts.aspx?AID=327] . The program runs from 9 a.m. to 1 p.m. Monday-Thursday from July 1 to Aug. 1 at Cherry Hill East. Registration is $295 per child; prices include music and a shirt. This is a wonderful chance for your child to perform with new friends who share their same passion! For more information or to register, call (856) 488-7868, e-mail Recreation@chtownship.com, or go to www.CherryHill-NJ.com [http://www.cherryhill-nj.com/admin/www.CherryHill-NJ.com] . My office has received several calls this week about the National Prescription Drug Take Back Day, scheduled to take place at locations across the United States this weekend. Cherry Hill is not participating in that event this year. However, Cherry Hill does participate year-round in Project Medicine Drop, a partnership with the New Jersey Attorney General's Office. Residents can deposit unwanted medication at the Cherry Hill Police Department (820 Mercer St.) 24 hours a day, 7 days a week. For details and guidelines, click here [http://www.cherryhill-nj.com/DocumentCenter/View/1458] . Camden County will host another free chair yoga class for seniors, from 1-2 p.m. next Wednesday, May 1, in the N. John Amato Council Chambers (Room 208) at Town Hall. Chair Yoga allows individuals to participate at their own level, while building flexibility and strength through the exercises taught by yoga expert and registered nurse Barbara Piotrowski. Two more sessions will be offered, on Wednesday, May 15, and Wednesday, May 29. For more information or to register, call (856) 488-7868, or email Recreation@chtownship.com [mailto:Recreation@chtownship.com] . Looking for a fun way to celebrate Earth Month? Visit Recyclebank to travel back in time to some major milestones of the past, starting with the very first Earth Day in 1970. 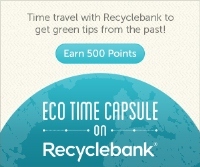 Inside Recyclebank's Eco Time Capsule [http://bit.ly/10Pajrt] , you'll be able to collect tips for living green today while exploring pop-culture trends and events from the last four decades. You could earn more than 500 points throughout the month! Each week through May 11, Recyclebank will bring you another decade of trivia and tips, so keep going back. It's just one of the many ways you can earn points for deals and discounts at Recyclebank.com.